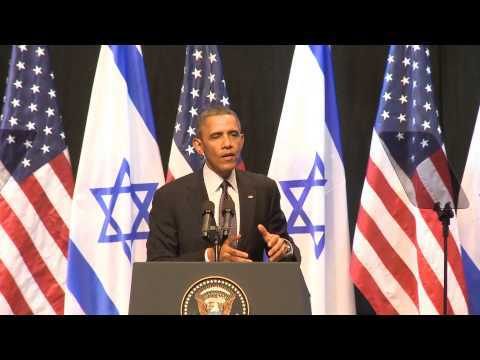 President Obama speaks to the Israeli people. This is President Obama’s recent speech to the Israeli people – one of the most reassuring he has made to Israelis during his presidency, explicitly acknowledging their right to a Jewish state living in security next to its Arab neighbours, backed by the strongest country in the world [the USA]. I don’t know what his true vision or policy is, but this will definitely improve his reputation amongst Israelis and American Jews who have been very anxious about him. My only reservations are his comments insisting that the Palestinian Authority, led by Mahmoud Abbas, is a partner for peace. I am not so sure. To date, I feel that the only difference between the PA and Hamas is their strategy for eliminating Israel. In summary, a Palestinian Arab man, Khalil Hanun, was imprisoned after refusing to vacate a property that a court ruled, was owned by somebody else. Oh, and the other party happened to be Jewish. In any normal country, when a squatter or bad tenant refuses to leave following an eviction order, would this person not expect to be arrested, fined or imprisoned? And would this normally be considered newsworthy? No it wouldn’t, but standards are different when the action involves Israel. 1. Did the group of Jewish people purchase the property from the Ottoman Turk authorities who were sovereign at the time? Yes or No? 2. Under what law or capacity did the UN Relief and Works Agency act when giving the Palestinian Arabs possession of the land, considering that it was occupied by Jordan at the time? The answers to these two questions are sufficient to determine the outcome of this case, without introducing emotive racist or nationalist arguments. Jersualem was a united city until one half was captured by Jordan (formerly Transjordan) during the 1948 war, following their decision to take part in the Arab attack on the newly declared state of Israel. Jordan annexed the area in 1949, but this was not internationally recognised, except by Pakistan and Great Britain. The area, Sheikh Jarrah, was historically a Jewish neighbourhood until Arab rioters drove them out in the 1920’s. Jordan drove out the Jewish inhabitants from the remaining part of Jerusalem under their control during the 1948 war. Israel recaptured Jerusalem at the end of the 6-day war in 1967, many of the neighbourhoods that were rebuilt are in fact former Jewish areas. I do not know all the facts, so I will keep an open mind. I wish Mr Koutsakis and his ilk would do the same. Updated 8:09pm, 19-8-2008: Other sources on the net refer to them as the ‘Al-Kurd family’.